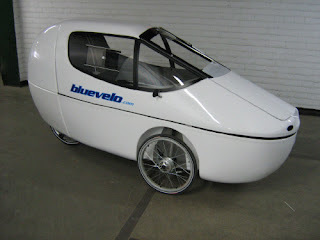 The Cab Bike is yet another is available at www.bluevelo.com. Produced in Canada and Engineered in Germany, it has a base price of just about 10,000 dollars, This little gem has the benefit of a clam shell type front opening and a front windshield wiper. It also has all the necessary items like a horn, lights and such as options. 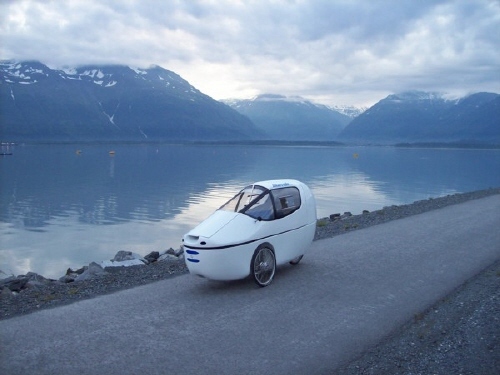 This one is also available as an electric assist model. It has a full suspension, internal hubs and the rear motor is built into the wheels hub. It is interesting to note that an extra cost option replaces the electric assist with a 14 speed Rohloff internally shifting hub. We assume this replaces the electric assist as a result of both of them using the internal hub of the rear wheel. This seems to be one of the few fully enclosed cabin velomobiles with a windshield wiper.